(NewsUSA) - The winter holidays are all about giving -- giving thanks, giving gifts, giving to charity. In the past, you might have given your mother a bracelet and made a donation. Today, the line between purchasing a gift for a loved one and helping someone in need has merged. Some people make donations to a favorite charity in a loved one's name. Others purchase gifts that donate part of their proceeds to a worthy organization. Now, Kiehl's Since 1851, a company that creates skin and hair care formulas derived from the most unique natural ingredients, is collaborating with Jeff Koons, to benefit The Koons Family Institute, an initiative of the International Centre for Missing and Exploited Children (ICMEC). The Koons Family Institute was created by Jeff Koons, an internationally recognized artist best known for iconic sculptures such as 1986's "Rabbit" and 1992's "Puppy." Koons is less well known as the father of an abducted child. Koons has fought for custody of his son on two continents without success. This experience had made him a fervent advocate for protecting children. Koons has partnered with Kiehl's to raise awareness and funds for child protection through the sale of the Limited Edition Creme de Corps Holiday Collection, which contains four products. Each product in the collection features the artwork of "TULIPS," a Koons painting from his Celebration Series. One hundred percent of Kiehl's Worldwide Net Profits up to $200,000 will benefit The Koons Family Institute and ICMEC. Surely, your loved ones will enjoy knowing that their gift raised money to help children just as much as the luxurious, skin-softening products in the Creme de Corps Holiday Collection. The Creme de Corps Holiday Collection features three sizes of Kiehl's iconic Creme de Corps body moisturizer as well as a new product: Kiehl's Creme de Corps Soy Milk & Honey Whipped Body Butter. The rich, air-whipped butter delivers rich hydration for up to 24 hours with skin-soothing ingredients like shea butter, beta carotene, vitamin E and squalane -- a highly refined moisturizing oil derived from the olive. For more information, visit www.kiehls.com. 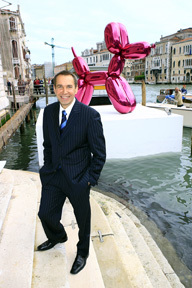 Artist Jeff Koons (pictured) is teaming with Kiehl's Since 1851 to raise money for The Koons Family Institute, an initiative of ICMEC to help missing and exploited children.